SL Women's Fit - On average, women's backs are not quite as long as men's. 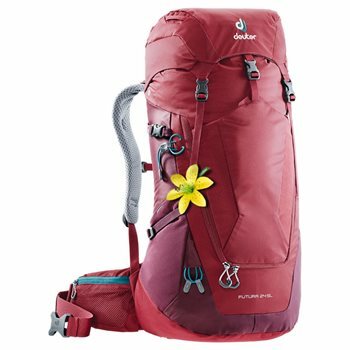 The SL carry system is thus slightly shorter than that of Deuter's standard rucksacks. Aircomfort System - On small to medium backpacks that are at home in easier terrain we go for maximum ventilation. The heart of the Aircomfort systems – tested and proven for decades – is its flexible spring steel frame. It is extremely durable, provides stable tension for the airy back mesh and creates the ventilation space between pack and wearer’s back for the moist, warm air to dissipate. 1984 Deuter invented & patented the first mesh back system worldwide. Active Comfort Fit - To guarantee a perfect fit, the backpack should sit as close to the body as possible. Thus, the weight can be evenly distributed on the entire back. The Active-Comfort-fit system achieves its fantastic carrying comfort with a stable, padded construction. Spring Steel Frame - The round spring steel frame is very lightweight and flexible. It is extremely durable, provides stable tension for the back mesh and transfers the load to the hip belt. Its flexibility guarantees great freedom of movement and a perfect fit. Front Opening - A zipped opening on the front of the pack provides easy access to lower packed items. Lid pocket - This pocket integrated into the lid guarantees quick access to your gear.